The red tide blooms in Florida this year have gained not only a full response from local and state resources, but a national spotlight from news media across the country. 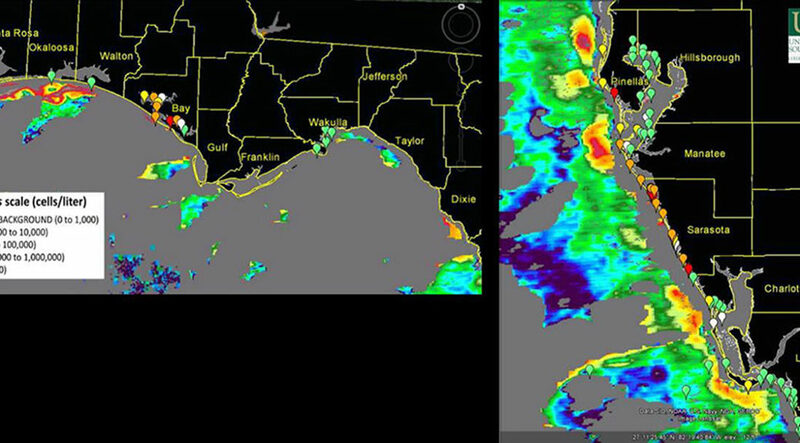 As of this writing, there are three separate blooms affecting the Panhandle, Southwest Florida, and the Atlantic Coast. Over 10,000 water samples later, FWRI and FWC continues to respond to one of the most severe and widespread blooms of Karenia brevis in recent years. FWRI’s new red tide map updates daily, automatically populating the interactive map with red tide data from the last 8 days of sampling. Our new map has been well received by the public and provides valuable data on a more immediate basis than our previous twice-weekly reports. This change illustrates FWRI’s commitment to providing the public with accurate, scientifically-verified data, and responding to public comment and criticism. FWC field staff transporting a large adult female manatee rescued for red tide to rescue partner, Clearwater Marine Aquarium, who then transported the manatee to SeaWorld for rehabilitation. FWRI’s Marine Mammal Stranding unit continues to be a crucial component for manatee rescue during these severe red tide blooms. 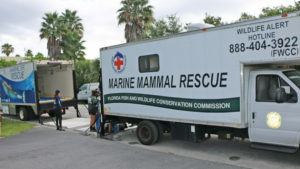 Once a citizen calls in a stranded or distressed manatee to the Wildlife Alert Hotline, Marine Mammal Stranding responds to the incident and, depending on the location in the state, the manatee is then transferred to rehabilitation facilities. Manatees have had heavy losses related to red tide this year – at last count 182 manatees – but the number would be higher if not for the diligent efforts of the Marine Mammal Stranding team. The Fish Kill Hotline continues to be a successful program, with concerned citizens reporting over 1,300 individual fish kills in Southwest Florida alone. Floridians across the state have assisted FWC in the monitoring – and in many cases assisting fish kill clean-up – of the red tide blooms with the Red Tide Offshore Monitoring Program. Red tide response from FWRI extends to many levels of the organization, including Communications. In addition to answering inquiries from the public and press, Communications creates products such as infographics, press releases, newsletters, videos and more. 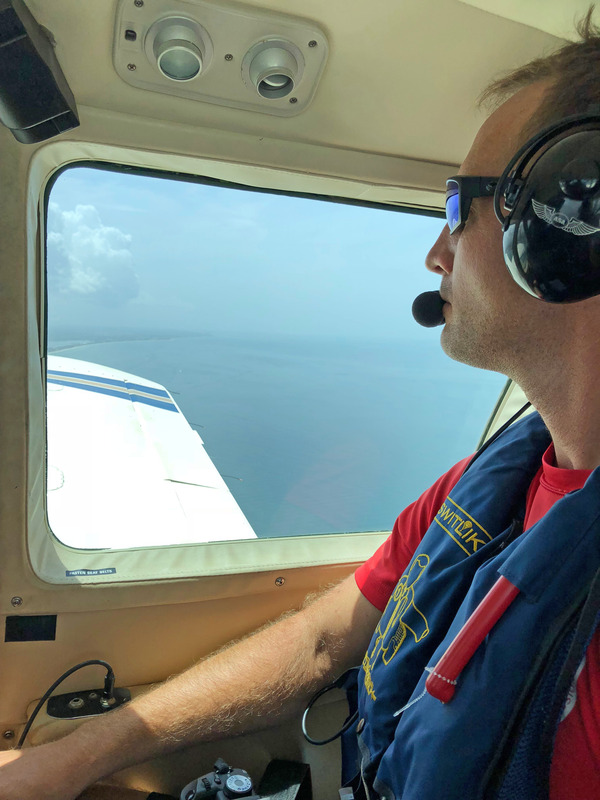 In addition to water sampling, FWC conducted flyovers with Law Enforcement aircraft Panther 1 in 5, 7 and 10 mile surveys along Pasco, Pinellas, Manatee and Sarasota counties on September 9th, 2018. These observations provided visual confirmation of blooms and provided researchers with visual data on fish kills, manatee mortalities and more. Observations from the 10 mile survey estimated that the bloom extended at least 15 miles offshore in some areas. FWC’s research scientists conduct aerial surveys as part of red ride response. Data is also gleaned from the Copernicus satellite program, which observes chlorophyll concentrations in surface waters. Satellite observations are not infallible, however, as cloud cover obscures observation capabilities. Combining satellite and aircraft observations with extensive water-sampling data can begin to paint an accurate picture of the dynamic red tide blooms. Moore’s law shows us that technology is constantly improving, and so we hope to see increased precision in monitoring capabilities as time progresses. FWC hope to continue to embrace current and emerging technology to help better track, monitor and mitigate red tide blooms in Florida. Subsisting primarily on a diet of earthworms and spiders, the silvery-gray reticulated flatwoods salamander (Ambystoma bishopi) and the frosted flatwoods salamander (A. cingulatum) inhabit the pine flatwoods-wiregrass ecosystems of the panhandle of our state. Both species of salamanders are long and slender, with a maximum length of about 5.2 inches (13 centimeters). 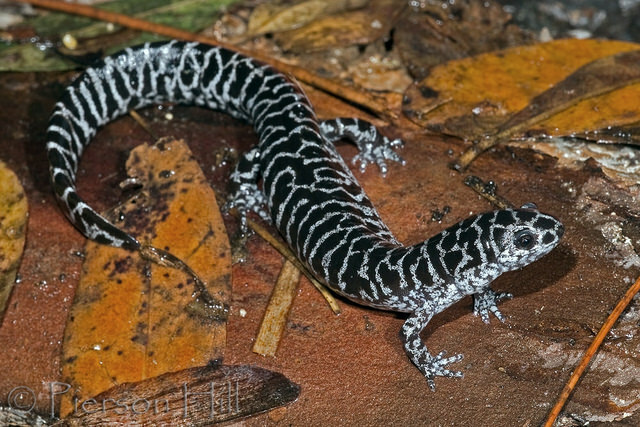 The frosted flatwoods salamander and the reticulated flatwoods salamander depend on isolated herbaceous ephemeral ponds situated within longleaf pine savannas and mesic flatwoods to complete their life cycles. Adults migrate from their upland retreats to breeding sites on rainy nights from October through December. Long thought to be a single species, the flatwoods salamander was listed as federally threatened in 1999. 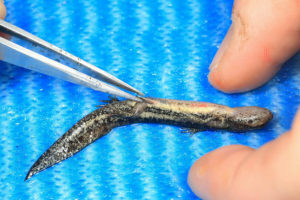 Subsequent genetic analyses revealed that the flatwoods salamander was actually two evolutionary separate but ecologically similar lineages. 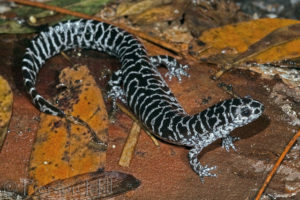 In 2009, the US Fish and Wildlife Service amended its listing of the flatwoods salamander, listing frosted flatwoods salamander as a Threatened species, and the reticulated flatwoods salamander as an Endangered species. Most known populations of flatwoods salamanders have been lost to the destruction of the longleaf pine ecosystem, which has largely been converted to development, commercial pine plantations, or agricultural uses. Populations that remain on public conservation lands continue to decline and disappear. Flatwoods salamander breeding habitats were historically maintained by early summer lightning-ignited wildfires that burned through shallow wetlands when they were dry. Modern prescribed fire practices favor burning under unnaturally cool and wet conditions of winter and spring, causing fire to be excluded from inundated wetlands. The result is that most breeding sites have become thickly encroached with woody trees and shrubs, eliminating the plant communities that the salamanders require for nesting and larval survival. Our Uplands Habitat biologists are currently in the Apalachicola National Forest sampling plants in ephemeral ponds that have undergone restoration to make them suitable for flatwoods salamander breeding. 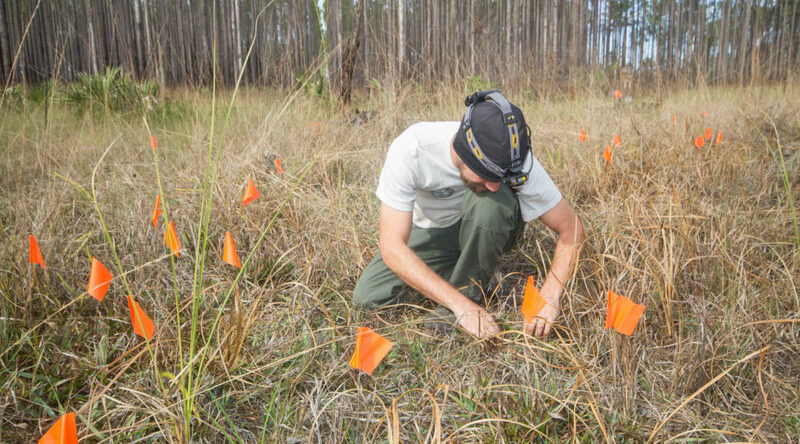 FWRI researchers are working to quantify vegetation characteristics—such as plant species composition, abundance, and distribution—that have been qualitatively described for flatwoods salamander nesting habitat. For example, pipeworts (Eriocaulon spp.) and switchgrasses (Dichanthelium spp.) are important plants sought out by the flatwoods salamander because females lay eggs on the moist soil beneath their leaves. Over the last two winters, FWC biologists in the Reptile and Amphibian Research lab have worked long hours headstarting larval frosted flatwoods salamanders in the Apalachicola National Forest. The aim of headstarting is to boost salamander numbers in critical populations until their breeding ponds can be restored to suitability. Staff scientists collect eggs from dry breeding ponds in December and bring them in to the lab. Once the embryos develop sufficiently, the eggs are hatched into large water-filled “cattle tank” mesocosms. Because mesocosms are food-rich and predator-free environments, larval survival rates can be much higher than in the wild. In April and May, larval salamanders are captured from the mesocosms as they lose their gills and transform to air-breathing metamorphs. They are marked with coded color tags or microchips, and released them back into their ponds of origin. Breeding ponds are monitored to determine if headstarted salamanders successfully return to breed in subsequent years. View our Flickr album documenting the efforts to boost the population of this rapidly declining salamander species. Warm congratulations to FWRI biologist, Pierson Hill, for receiving the Southeast Partners in Amphibian and Reptile Conservation (SEPARC) 2018 Conservation Hero Award! This award is given in recognition for making significant contributions to the conservation of amphibians and reptiles in the southeast region, and successfully achieving on-the-ground conservation for herpetofauna by preventing loss of species or their habitats. Pierson is working on several projects focused on recovering populations of the critically imperiled frosted flatwoods salamander. Biologist inserting a PIT (Passive Integrated Transponder) tag into a salamander. These tags are similar to the microchips used for pet cats and dogs. Each tag is a bit larger than a grain of rice and contains a unique ID that can be read with a handheld scanner. Over the past two winters, Pierson has led a team that collected and hatched salamander eggs that would have otherwise perished due to unusually dry conditions. The team has rescued over 2000 eggs, donated more than 400 for captive breeding efforts, and released 1300 metamorph salamanders back into the wild. His efforts have provided a critical boost to rapidly declining populations and made headway in the methodology of headstarting this beautiful and fragile species. Many rivers experience natural fluctuations in flow, including periods of extremely high water levels. As surrounding floodplains inundate, nutrients and habitat become available for numerous aquatic organisms. Many species of fish have adapted to use these conditions for spawning and nursery habitat over time. Changes to the flow of water within a river system can affect the spawning behavior of adult fish and alter important food sources and refuge for juvenile fish. Water level fluctuations can also impact the number of fish surviving to enter a fishery. These potential problems created an opportunity for freshwater fisheries biologists studying fish populations in the Apalachicola River and associated sloughs in northwest Florida. In 2005, biologists with FWRI’s Aquatic Habitat and Restoration Enhancement Subsection, the Office of Conservation Planning of the Division of Habitat and Species Conservation and the University of Florida began a project to study the effect of water levels and flow, or floodplain inundation, on year-class strength on native fishes of the Apalachicola River. 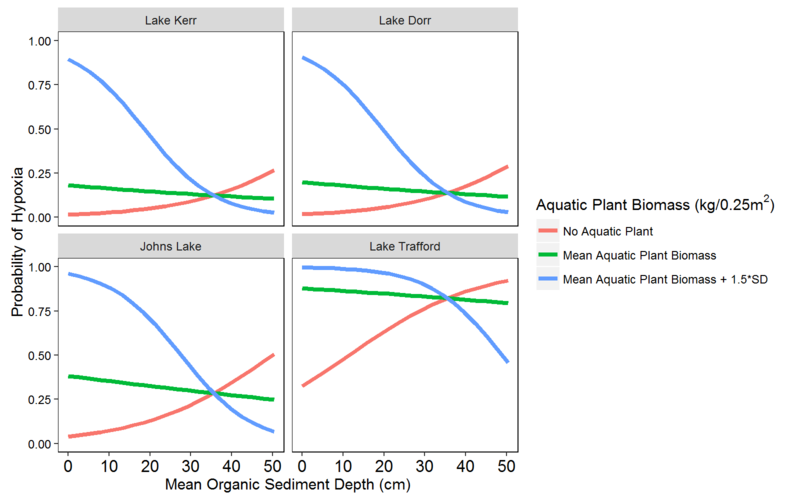 This research is part of a long-term monitoring study on the sloughs and mainstem of this important north Florida river system. The Chattahoochee and Flint rivers, with headwaters in Alabama and Georgia, combine to form Lake Seminole on the border of Georgia and Florida. The Apalachicola River originates from the Jim Woodruff Dam at the base of Lake Seminole and flows 106 miles south to Apalachicola Bay. Historic droughts and increased water demands in the upstream portion in Alabama and Georgia have decreased flow in the downstream portions. Over time, the Apalachicola floodplain has been inundated less frequently and to a lesser magnitude than it has historically. 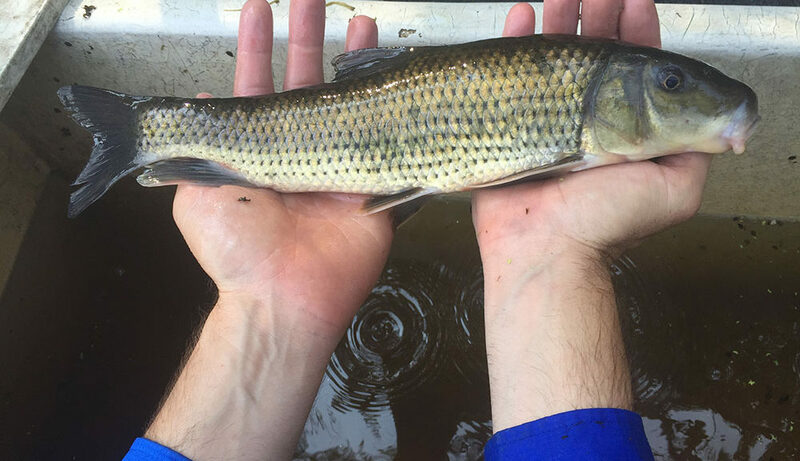 Biologists needed improved information on the effects of flow and floodplain inundation on important fisheries in the Apalachicola River system. Researchers are collecting information on the relationship between water levels and flows and the recruitment of largemouth bass, redear sunfish and spotted suckers. These species were selected based on their feeding and habitat requirements within the river and floodplain. Fishes respond differently to hydrologic conditions based on life history traits, and these species occupy different trophic niches and provide a broad perspective on how discharge may impact fish populations in the Apalachicola River. Following similar methods established for this research project in 2005, 50 transects between mile markers 80 and 20 in the main channel of the Apalachicola River are randomly selected and electrofished by boat (pulsed direct current) for ten minutes per transect. Randomly selected transects from ten sloughs connected to the main channel are also sampled via electrofishing. All largemouth bass, redear sunfish, and spotted suckers are counted and measured, and sagittal otoliths (largemouth bass and redear sunfish) and asteriscus otoliths (spotted suckers) are removed from a subset of fish. Otoliths, commonly known as “earstones,” are hard, calcium carbonate structures located directly behind the brain of bony fishes. Otoliths help FWRI biologists determine the age of fish as well as the growth rates of various species. 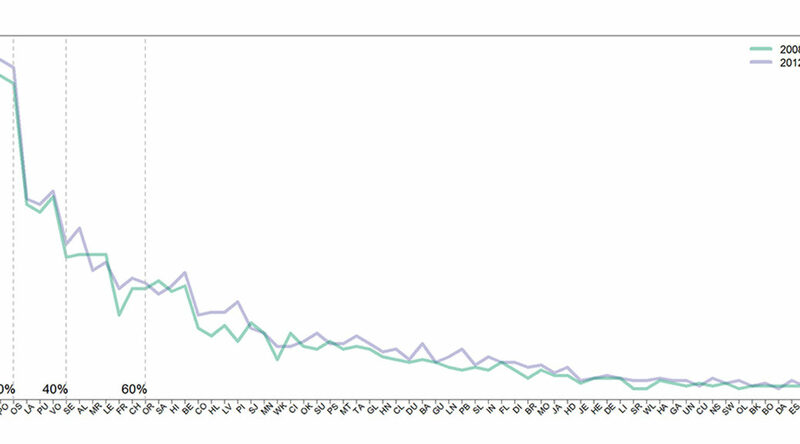 The extrapolated catch per unit effort (CPUE) for age-0 fish of each species is averaged among transects to obtain a mean catch rate. To compare CPUE data among years and perform more robust analyses, researchers collect CPUE at age data for each species from 2005 to present from both main channel habitat and slough habitat. FWC biologists obtain river discharge data from the U. S. Geological Survey on the Apalachicola River near Chattahoochee, Florida, and a linear regression model is used to evaluate the relationship between river discharge and year-class strength of largemouth bass, redear sunfish, and spotted suckers in the Apalachicola River. Field work is ongoing, and additional statistical analysis will continue for years to come. The FWC has 12 years of data that cover a variety of meteorological and hydrological conditions, and annual field research will incorporate additional meteorological and hydrological conditions and more recruitment information over time. Data has shown that strong year classes for these species on the Apalachicola River system are strongly correlated with extended periods (or days) of floodplain inundation and flows. If more water is provided to Florida, these species will continue to thrive and prosper in this river system. It’s hard to believe, but 2018 will mark the 20th year of existence for the Upland Habitat Research & Monitoring Program! Quite a few evolutionary changes have occurred over the span of 2 decades. The program had its origins back in 1998 as the brainchild of Nick Wiley, former executive director of FWC, and was funded by the Conservation and Recreation Lands (CARL) trust fund, the precursor of the Land Acquisition Trust Fund (LATF). Prior to agency reorganization, the program at the time was housed in the old Bureau of Wildlife Management, the predecessor of the Wildlife Habitat Management Section (WHM), and was created specifically to use applied research to address management issues within the agency’s Wildlife Management Area (WMA) system. Over the years, the program has been known by a few different names including the Adaptive Management Section, and the Plant Monitoring Section before the current title was acquired after the agency reorganized in 2004. However, Upland Habitat continues to be closely allied with WHM, and conducts research within the WMA system to develop best management practices for upland plant communities that can be used by land managers across the state. The advantage of working on specific WMAs is that the manager can often see the experimental results immediately, and has a pretty good idea of what is working without having to wait to read about it later in a report. Past research has included monitoring the effects of grazing on upland plant communities, evaluating mechanical vegetation control methods for managing scrub and flatwoods, and helping to develop the agency’s Objective’s Based Vegetation Monitoring (OBVM) program, an adaptive management program that is ongoing to this day. In 2004, Upland Habitat was moved to the FWRI during the agency-wide reorganization . Itwas placed within the Ecosystem Assessment and Research Section, first under the direction of Jennifer Wheaton and currently led by Dr. Amber Whittle, where it continues to grow and expand. The program was relatively small back in 1998 consisting of only three biologists– Kent Williges, current program leader, is the only original employee remaining. 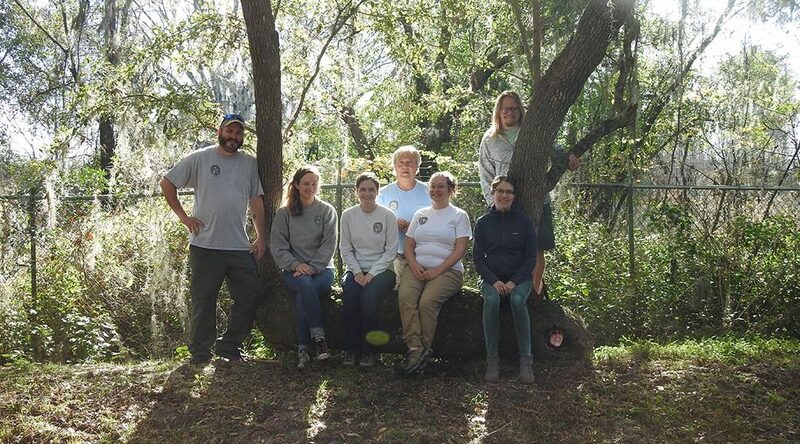 The program continues to grow post-merger, and currently consists of nine full time biologists headquartered at the Wildlife Research Laboratory in Gainesville. Upland Habitat continues to focus research on all things related to botany. In that way, they have been able to establish a niche within the agency. Staff handle many requests for plant identification throughout the year from both WMA staff and the general public. They often determine the seed viability of native seed mixes for planting on WHM ground cover restoration projects. Current research for WHM funded by the LATF includes investigating methods for control of cabbage palm in wet flatwoods, comparing chemical control methods for hardwood reduction in upland plant communities, and monitoring the effects of mechanical control methods on ephemeral ponds associated with the flatwoods salamander. In addition, Upland Habitat has evaluated and provided management recommendations for WHM ground cover restoration projects for the past 13 years. The classic skull and crossed ‘Liatris’ logo of the Upland Habitat Research & Monitoring Program will sport a new bandana throughout 2018, commemorating the 20-year anniversary. Quantifying habitat characteristics has also become the Upland Habitat program’s specialty. Scientists are currently measuring structural attribute characteristics of wildlife habitat, and monitoring their response to management treatments for 2 endangered species including the Sanibel Island Rice Rat, and the flatwoods salamander. These projects are funded by the Aquatic Habitat Restoration and Enhancement Section, and a Cooperative State Wildlife Grant, respectively. They are also investigating pollinators in both native, and restored plant communities as part of a cooperative project with the University of Florida. The next 20 years will undoubtedly present many new challenges for Florida’s land managers as the population continues to increase with seemingly no end in sight. Upland Habitat will continue to utilize applied research to address upland plant community (and some wetlands) management issues within an ever-expanding urban landscape for the benefit of all of Florida’s habitat, wildlife and people. In 2016, we began a 10-year project to restore bay scallops to self-sustaining levels in Florida’s Panhandle. 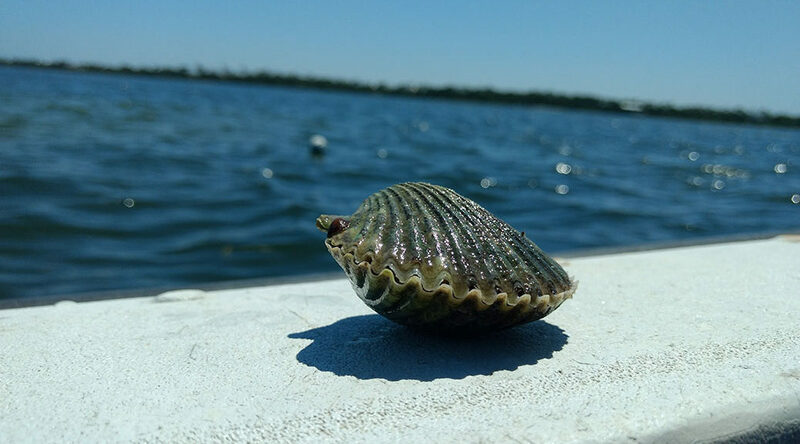 The objective of the scallop restoration project is to enhance the public’s use and enjoyment of Florida’s natural resources by enhancing depleted scallop populations and reintroduction to suitable areas from which scallops have disappeared. The restoration work includes enhancing local scallop populations in targeted areas through a combination of the harvest and redistribution of naturally-occurring juvenile and adult scallops supplemented with stocking from a commercial scallop hatchery. In addition to traditional approaches to restoration, our vision for restoring scallops also includes educating the public on our ongoing restoration projects and asking them to be contributing partners in these efforts. 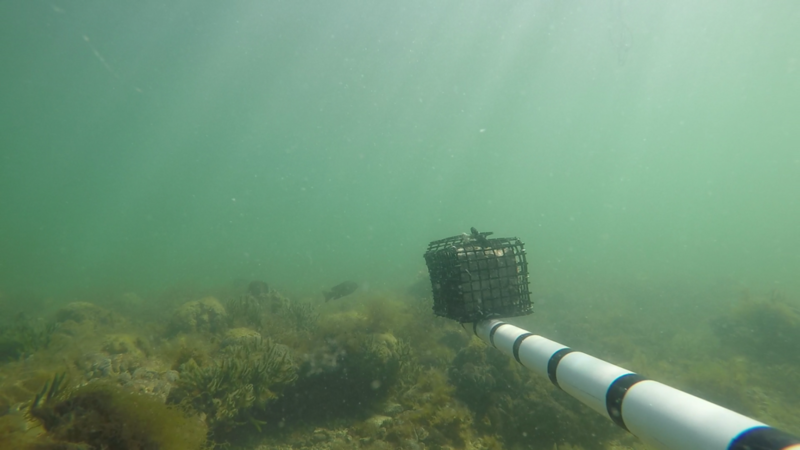 Since the project began in 2016, we have worked with community members in St. Joseph Bay to collect scallops prior to the opening of the scallop season and place them in cages in an exclusion zone protected from harvest. We are currently working on developing partnerships with interested NGOs, county officials, schools, and the private sector to help restore scallops in St. Joseph Bay and St. Andrew Bay. Our plan is to provide scallops and predator exclusion cages to community members in these areas prior to the 2018 scalloping season. 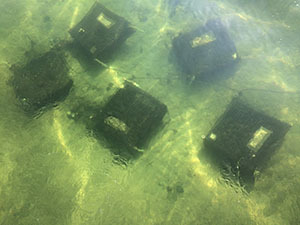 Community members will hang their cages with scallops from privately owned docks or, if they have a boat, they can place these cages in the bay. Volunteers must be willing to clean the cages at least once each month as well as monitor the scallops. We hope that by partnering with the community next year we will increase our chances of successful restoring scallops to St. Joseph Bay and St. Andrew Bay. In Florida, FWC free-ranging wildlife veterinarians are key members of a statewide effort to detect and control diseases that threaten fish and wildlife, domestic animals, and people. 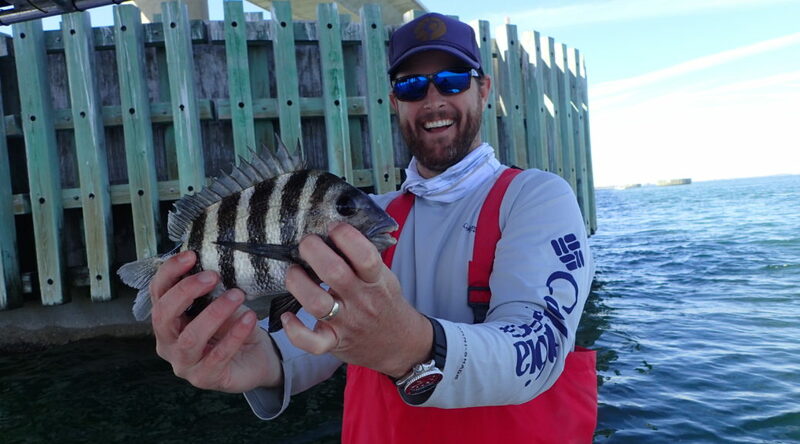 Stressed by altered and fragmented habitats, environmental contaminants, toxins and global climate change, Florida’s fish and wildlife populations are increasingly vulnerable to disease. Also, Florida’s geographic location, subtropical climate and large human population put the state at high risk for wildlife diseases brought in by exotic and invasive species, increased global travel, and translocation of wildlife. Staying on top of these threats requires surveillance, prevention, and expert technical assistance. providing technical expertise (including expertise regarding animal welfare) (FWDST, 2012). The FWC Aquatic Health unit focuses on fish and aquatic mammals. The Wildlife Health unit focuses on terrestrial wildlife health including mammal, avian, reptile, and amphibian populations along with their ecosystems. The FWC Wildlife Health unit conducts surveillance for several wildlife diseases. Highly Pathogenic Avian Influenza (HPAI) FWC monitors hunter-harvested waterfowl and live-captured waterfowl and investigates bird deaths for HPAI, a disease that can cause human deaths. Using an on-line form at http://MyFWC.com/bird, the public or other agencies can report bird deaths. The information is relayed to veterinarians and biologists in real time. Chronic Wasting Disease (CWD) in Deer This disease, believed to be caused by a prion, is similar to bovine spongiform encephalopathy and scrapie. CWD is the only infectious prion disease known to occur in wildlife. Active surveillance involves random sampling of hunter-killed and road-killed deer. Passive or targeted surveillance involves necropsy and testing of deer found sick or dead of unknown causes. The public, other agencies, and biologists can report suspicious cases by calling the CWD hotline at 1-866-293-9282 (1-866-CWD-WATCH). The line is monitored seven days a week, 365 days a year. Necropsies are conducted by FWC wildlife veterinarians and wildlife health biologists at the FWC Wildlife Research Laboratory in Gainesville, FL. 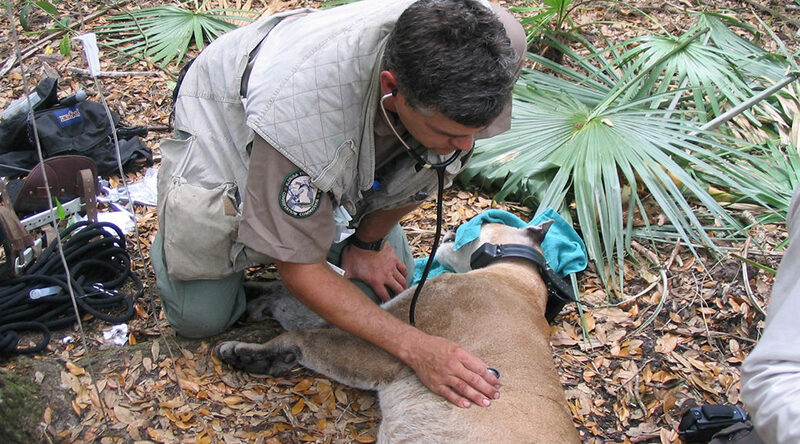 Florida panther disease surveillance FWC monitors the health of this endangered subspecies by periodically capturing and conducting complete physical examinations of young and adult panthers. All panthers found dead undergo complete necropsy. Managing or mitigating wildlife diseases is also an important responsibility for FWC veterinarians. As with domestic animal diseases, prevention is far more effective than treatment, and this is especially true for free-ranging wildlife populations as once a disease has been introduced there is often little that can be done to eliminate it. Regulations and outreach/education are important tools for preventing wildlife diseases. Vaccination as a preventive measure is rarely used in wildlife populations but can be useful in some endangered species. Two important regulations designed to prevent the introduction of CWD include the prohibition on importation of live cervids and on the transport of hunter-killed carcasses from CWD-positive states. Press releases, notices in hunting regulations, and other outreach programs are also used to help prevent the inadvertent movement of CWD-infected deer into Florida. Vaccinating Florida panthers against feline leukemia virus (FeLV) may have helped end an FeLV outbreak in 2004 (Cunningham et al., 2008). Continued FeLV vaccination of live-captured panthers is designed to help stop the chain of transmission if the disease spills over into the panther population. In 2016, FWC and US Fish and Wildlife Service (USFWS) veterinarians assisted with the outbreak of New World Screwworm in Key deer in the Florida Keys. Veterinarians performed humane euthanasia as well as capture, immobilization and treatment of infested deer. FWC free-ranging wildlife veterinarians conduct forensic necropsies, provide wildlife immobilization and anesthesia, and occasionally surgically implant radio telemetry transmitters. Veterinarians also address wildlife animal welfare issues including proper methods for humane euthanasia as well as establishing agency protocols for capture, immobilization and other management or research activities. Although wildlife rehabilitation is not a large focus of Florida’s Wildlife Health program or other government wildlife agencies, in cases of endangered species such as the Florida panther, rehabilitation of injured or orphaned panthers and release back into the wild can serve as a management tool to help recover the population. In summary, FWC’s free-ranging wildlife veterinarians perform a variety of services including disease surveillance, disease prevention and response, and technical assistance. Given the wide range of skills needed and the diversity of species they work with, the free-ranging wildlife veterinarian must be able to work as part of a team and draw on the expertise of wildlife biologists and other veterinarians. Cunningham, M. W., M. A. Brown, et al. 2008. Epizootiology and management of feline leukemia virus in the Florida panther. Journal of Wildlife Diseases 44(3): 537-552. Fish and Wildlife Disease Standing Team. 2012. Fish and Wildlife Disease Standing Team Charter. Florida Fish and Wildlife Conservation Commission, Fish and Wildlife Research Institute, St. Petersburg, Florida, 4 pp. With a population estimated at approximately 500 individuals, the North Atlantic right whale is one of the most endangered large whales in the world and the southeastern U.S. is their primary calving area. Since 1987, the Fish and Wildlife Research Institute (FWRI) has carried out right whale research, rescue and monitoring efforts to aid recovery of the species. Most of this work is supported by grant funding provided by the National Marine Fisheries Service (NMFS). FWRI collaborates with Federal, State and non-governmental organization partners to conduct field research mainly involvingaerial surveys, biopsy sampling, disentanglement and stranding response during the winter calving season. FWRI is one of a handful of major contributors to the North Atlantic Right Whale Catalog. 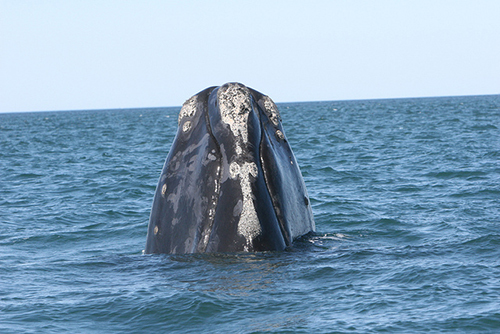 Photographs taken by staff are used to identify individual right whales based on the callosity pattern (a natural growth of rough, cornified skin) on their heads as well as human-related scars. Over time, population vital rates such as survival, reproduction and trends in health are monitored in part through this photo-identification research and genetic sampling. FWRI has also worked closely with partners to compile years of aerial survey effort and sightings data into a geographic information system (GIS). Analysis of these spatial data help scientists and managers to evaluate and predict right whale distribution patterns in the calving grounds in relation to environmental factors such as sea surface temperatures, water depth and human activities, such as vessel traffic. Catalog #3911, a two year-old female, photographed with a complex entanglement in December 2010. Over three weeks, the disentanglement team worked to cut knots and removed all the trailing rope. Unfortunately, her injuries were too severe and she was found floating dead in February 2011. Vessel collisions and entanglement in fishing gear are the leading known causes of death in this species. 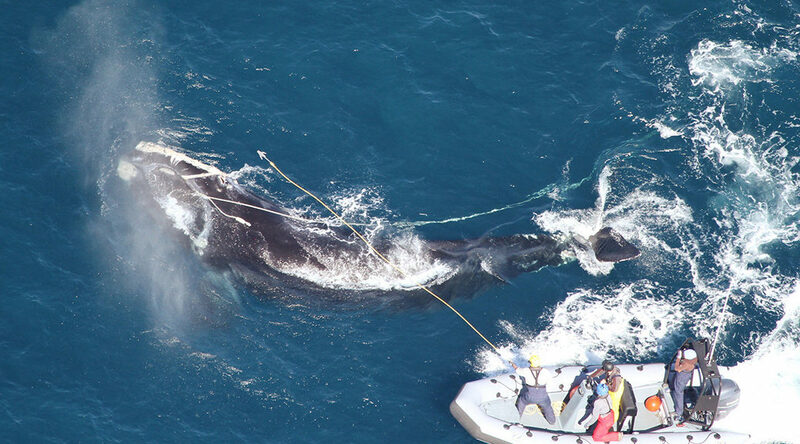 Scarring studies show that more than 80% of the right whale population has been entangled at least once. 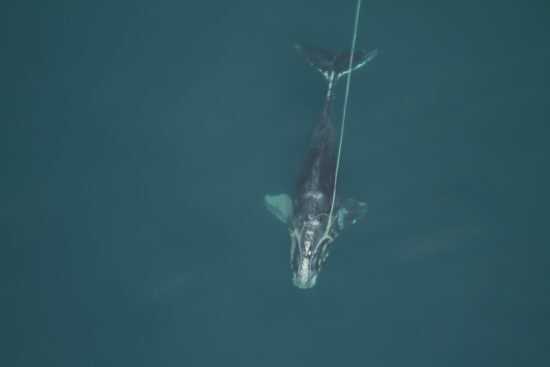 Right whales are generally strong enough to break away from anchoring gear and are typically found free-swimming with rope fixed in their mouth through their baleen, around their head, and wrapped around their flippers. Right whales can carry this gear hundreds of miles over months, or in some cases years, before either shedding the gear, being spotted and disentangled, or dying from their injures or starvation . FWRI is a member of the Atlantic Large Whale Take Reduction Team which was established by NMFS to help develop take reduction plans that mitigate the entanglement risk to large whales. Offshore disentanglement operations present diverse challenges that require training and preparation. The Atlantic Large Whale Disentanglement Network (ALWDN) permits response activities on an individual basis through NMFS’s Marine Mammal Health and Stranding Response Program (MMHSRP). The Center for Coastal Studies (CCS) in partnership with NMFS developed techniques for disentangling anchored and free-swimming large whales that were largely adopted from 19th century whalers. The whalers would attach barrels or logs to their harpoon line in order to slow the whale, keep it near the surface, and tire it. Disentanglement involves establishing a control line where buoys and drogues can be attached to add buoyancy and drag, but are also easily removed. The disentanglement teams work from small boats and use customized tools in order to establish working lines and strategically cut the entangling ropes. Over the past 30 years the ALWDN has developed new techniques and tools and has expanded up and down the eastern seaboard, successfully disentangling hundreds of large whales. In addition to freeing animals from entanglement, the network stresses documentation and gear recovery; both are used to assess the prevalence and impact of gear interactions as well as management strategies to prevent entanglement. FWRI has been an active member of the ALWDN for over a decade. Our latest disentanglement event occurred in January 2017; Catalog #3530, an adult male and regular visitor to Florida, was spotted with a life-threatening entanglement and several new wounds. The video below describes his disentanglement. The FWC Fish and Wildlife Research Institute’s (FWRI) Red Tide Monitoring Program was officially launched in May 2000. 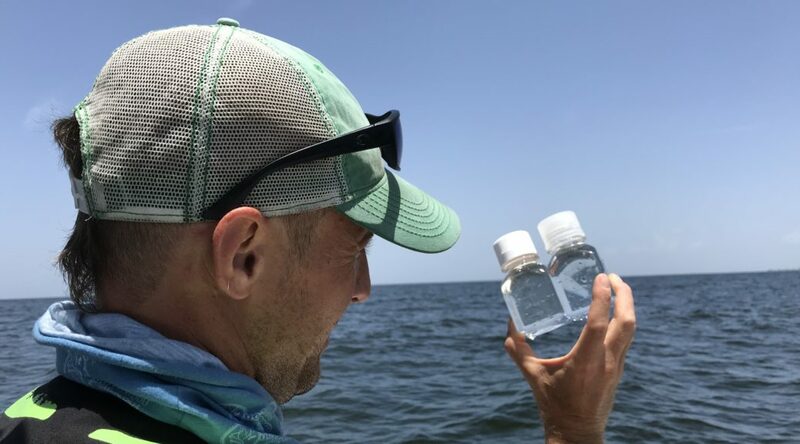 Local citizens were recruited to monitor blooms of Karenia brevis, the Florida red tide organism in offshore waters along Florida’s west coast. 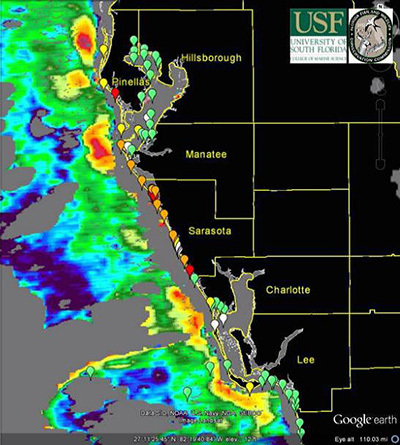 Red tide events were known to frequent southwest Florida, and a plan was needed to help coordinate monitoring efforts offshore during species population formation. 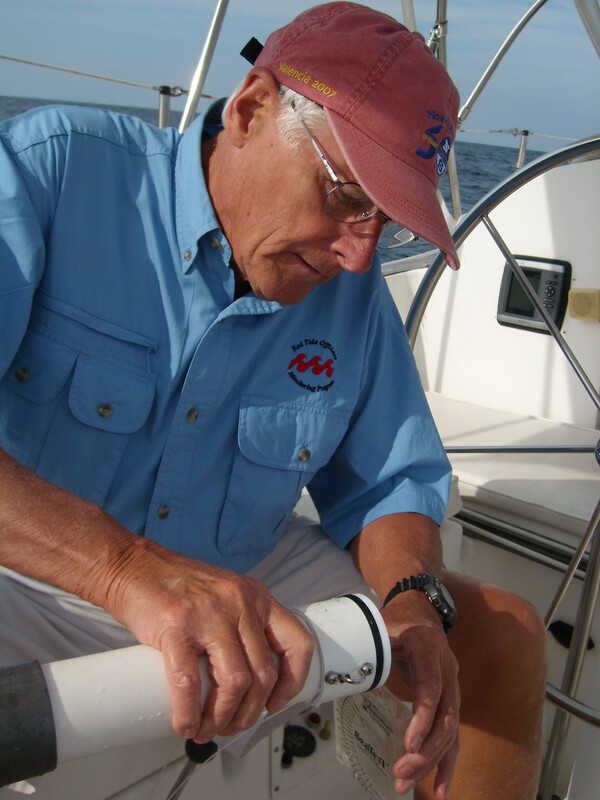 Today, sampling efforts have extended beyond offshore southwest Florida. The program’s primary goals now are to provide increased coverage for the early detection of K. brevis and other harmful algal blooms (HAB’s) in offshore waters of the Gulf of Mexico and the Atlantic Ocean, as well as alongshore beaches, inshore waters and coastal bays. This added coverage of volunteers in all coastal counties allows researchers to provide early warning to coastal residents in the area, continue lab research, and predict seasonal events. Because of limited state personnel, boats and other resources, the program relies on all kinds of volunteers including charter boat captains, commercial fishermen, school groups, university researchers and students, marine animal rescue centers, divers, private citizens, Coast Guard Auxiliary, and collaborating partners. Sampling and shipping supplies are provided for each volunteer by Karen Henschen, program coordinator. Karen sends out over 200 sampling bottles to volunteers every week. Bottles are readily available when volunteers go out on a recreational excursion, charter fishing trip, pier or dock fishing, or research field work. Karen coordinates participants from a network of volunteers associated with other environmental partners to share bloom information. In 2016, there are over 300 volunteers collecting 1,200/year in 31 coastal counties. 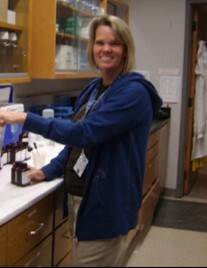 The first sample arrived at the FWRI microscopy lab facility in the summer of 2006, and within those years there has been over 11,000 samples collected. This is a true testament to the dedication and importance of everyone who has participated in this program over the years. 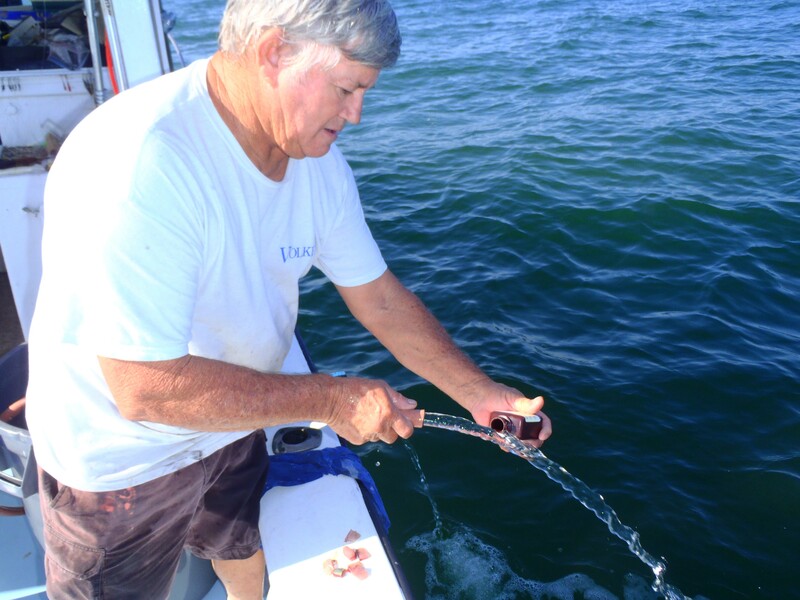 Strong winds, rough seas, or dark of night did not keep Red Tide Monitoring volunteers from water sampling during red tide blooms through the years. 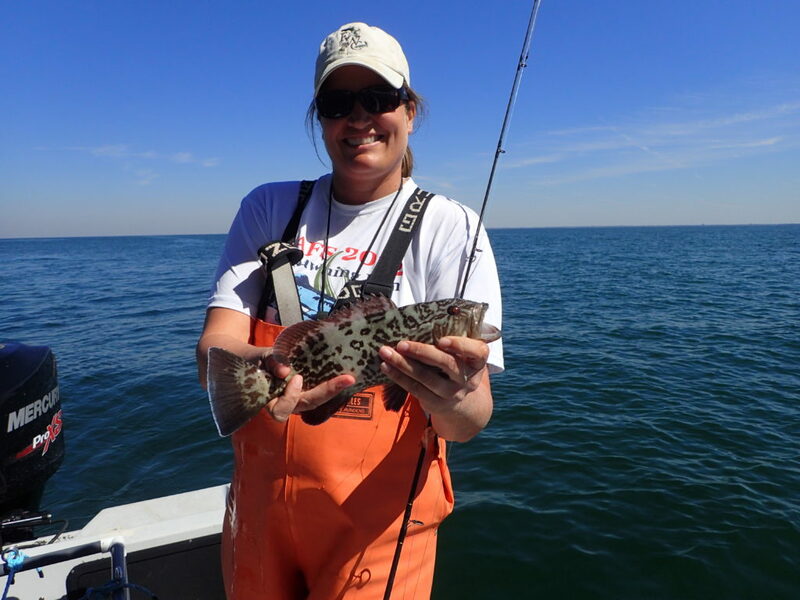 Karen also works closely with the FWC Fish Kill Hotline to help determine environmental concerns during marine animal mortality events. Once the volunteer collected samples are received by FWRI staff, they are examined under a microscope and species are identified and counted. Additional HAB species information is recorded at certain sites to help evaluate long-term trends in species composition and shifts in dominant groups (diatoms versus dinoflagellates). The field and lab observation provide a valuable snapshot of the phytoplankton community. This information is immediately used as necessary to guide additional sample collection in areas of concern. The results are reported to the appropriate state managers through the FWC/FWRI Red Tide Status Report, and the data is archived into the HAB Historical Database. 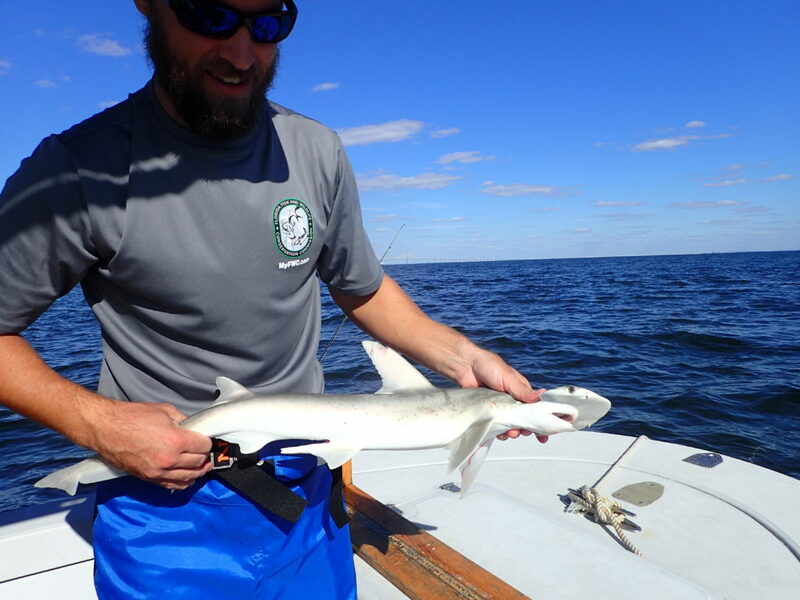 State managers and scientists can use this information to better understand HAB species, and the conditions they occur in Florida coastal waters. In fact, many of the certified shellfish growers in Florida voluntarily collect water samples and conduct the field observations because this valuable information helps them manage their harvest activities to ensure the safety of their product. Their data are also used to provide critical ground truth to confirm bloom location seen from satellite imagery provided by USF Optical Oceanography Lab. Each participant’s contribution is essential to piecing together a picture of the distribution of toxic phytoplankton along the Florida coast. With that understanding appropriate agencies and the public can be alerted of potential harmful algal blooms, and take the necessary precautions. This program succeeds because of these community partnerships that make expanded coastal coverage possible. The time and efforts they give to sampling and red tide event response is invaluable to scientists at FWC. Karen also recruits new volunteers daily in order to help cover Florida coastal waters during non-bloom events to help determine normal environmental conditions. Scientists are still struggling to understand what causes blooms, to predict their occurrence and to find a way to lessen their impact. Early detection by volunteers is forecasting critical component in scientists’ efforts to better understand harmful algal blooms. The Center for Biostatistics and Modeling provides statistical analysis advice and support to FWC staff. We are a service-oriented group that supports FWC’s mission much like the other Information Science and Management sub-sections such as the Center for Spatial Analysis, Information Access, and Research Information Sciences. Our goal is to ensure the validity and continually improve the currency of the scientific studies produced by FWC. We provide general statistical consulting services, develop efficient data management strategies, design study and sampling plans, perform cutting-edge quantitative analyses, produce high-quality graphics and collaborate with staff on peer-reviewed publications. In addition to these services we offer software and analysis training to help staff feel more comfortable with their statistical knowledge base. The center’s history began in the Lovett E. Williams Jr. Wildlife Research Laboratory in Gainesville back when it housed the Bureau of Wildlife Research under the Game and Fish Commission. It was the retirement of the lab’s namesake – Lovett William – in 1985 that started it all. Realizing the growing need for statistical support, research staff recommended that the commission replace Lovett’s turkey research position not with another biologist, but rather a statistician. By the time of the commission’s reorganization and creation of the Fish and Wildlife Research Institute (FWRI) in 2004, the group consisted of two full-time statisticians in Gainesville. Thanks to the support of staff and leadership, the center has grown considerably and now consists of four statisticians and a dedicated database manager. Staff in the Center for Biostatistics and Modeling have worked on a wide variety of projects touching every division within FWC and every subsection within FWRI. So far this year we have worked on a number of interesting projects including examining the persistence of bald eagle nesting territories, describing determinant growth in American alligators, estimating species richness on habitat restoration sites, estimating black bear abundance using spatial capture-recapture models, and estimated the impact of red tide on sea turtle mortality. Some examples of our work are highlighted in the included figures. If you have questions about study design, analysis, or are in need of statistical assistance or expertise, please feel free to contact any one of us.